So you’re building a beach home? Beach homes can be one of the most rewarding places to live. Although building in such a desirable location doesn’t come with out some special considerations. We’ve pulled together this information from our first hand experience and research designing homes on the Coast of North Carolina. Making sure you’re getting the most value out of your property is an important aspect of your investment and we always suggest working with a local architect or designer along with local engineers who have experience with building in coastal climates. These professionals will be able to guide you through the process of building a beach house and are familiar with best practices and design options for beach homes. This initial investment will reflect in the overall value of your home. Every beach town has different zoning requirements. If your property is located in an AEC zone (Areas of Environmental Concern) you’ll most likely need to apply for an appropriate CAMA Permit (Coastal Area Management Act). CAMA is a government program that regulates coastal development along government protected areas. 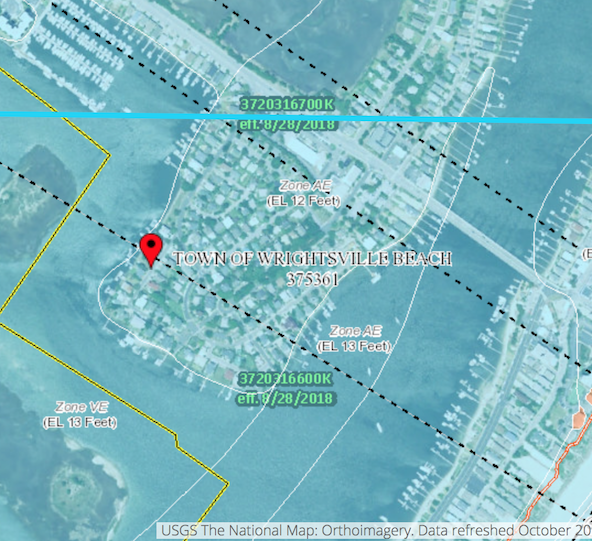 Most beach and waterfront properties will have CAMA setback requirements and also local setback requirements with the most stringent requirements taking precedent. This will determine your building footprint or how wide and deep your house can be along with how close to the water your allowed to build. We can help you initiate this important early research if it hasn’t already been completed as part of your due diligence by the real estate agents involved with the sale of the property. This process can take several weeks dealing with local government officials and engineers. There is no margin of safety other than elevation in flood prone locations so it is important to know your flood zone and requirements. These will determine if your house will be required to be elevated to avoid potential flooding. For example if your property’s flood zone is AE 16 this generally means your first floor is required to be elevated to 16 ft or more above sea level. -Zone X: Area of moderate flood hazard, usually the area between the limits of the 100‐ year and 500‐year floods. (Moderate to low Flood Risk). -Zone AE: The base floodplain where Base Flood elevations are provided and certain height restrictions will be required for first floor height. (High Risk Area). Zone VE: Coastal areas with a 1% or greater chance of flooding and an additional hazard associated with storm waves. These areas have a 26% chance of flooding over the life of a 30-year mortgage. Base flood elevations derived from detailed analyses are shown at selected intervals within these zones. Certain height restrictions will be required for first floor height. (High Risk Coastal Areas). Choose materials that will tolerate exposure to salt air that are naturally resistant to harsh weather such as decay-resistant woods, or composite materials that designed to withstand the coastal elements with little or no maintenance. While metal is a durable, strong material, left exposed it becomes vulnerable to salt air. Cedar and concrete are both great alternatives as they are both resilient and water resistant while remaining aesthetically pleasing. All exterior trim and siding should be non-wood composite materials such as fiberglass and non-cellular PVC plastic which are more weather resistant. While more expensive, standing seam metal roofs can provide better wind and corrosive protection. Some home owner insurance providers offer reduced rates for standing seam metal roofs. They also create a sharp architectural look. Laminated glass with impact-resistant coating can withstand strong wind pressure and debris while also increasing the overall stability of your home. Install 150 mph tested windows in hurricane-prone areas. Optionally, you can install exterior plastic panes and be sure that the panes are firmly attached for further protection. During the design phase be sure to have your design structurally engineered and stamped by a professional who will analyze wind load calculations for your home. This will ensure your home can withstand wind loads in your area. Consider low slope and hip roof systems to reduce wind loads. Some insurance providers offer discounts for these types of roofs. Ensure extra protection for your windows and doors by installing shutters or providing a system, such as a track, to easily install shutters in the event of an approaching storm. Because roof structures are prone to uplift from strong winds, it is very important to use the correct construction fastening systems. Be sure to inspect your gutters and downspouts to be sure there is nothing blocking the flowing water during a storm. Brace your garage door to prevent more extensive damage. Most garage doors are not reinforced which causes extreme pressure in windy conditions. For Hurricane prone areas create a Hurricane Household Plan. Hurricanes can pop up and quickly become a serious threat. Mandatory evacuations can happen with in days of a Hurricanes arrival. Once evacuations happen it sometimes becomes difficult to leave the area due to 100’s of thousands of people fleeing the area. Knowing where you will go and how your getting there can save time and stress. Heres a great Government website with more info. * This post will be periodically updated to present the latest information on building in coastal areas. 2x4 Designs Blog is a mix of info about Architecture and Design with a focus on Residential.